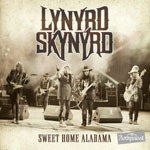 Share the post "Album review: LYNYRD SKYNYRD – Sweet Home Alabama (Live, 1974, 1996)"
One of my abiding gig-going memories is seeing Lynyrd Skynyrd on the cusp of wider UK recognition, playing Liverpool Empire in November 1974. It was the classic line-up three years before tragedy struck, and – not being familiar with their set-piece ‘Freebird’ – it was something of a revelation. During that period, the same band played Hamburg Musikhalle (in December 1974) and three tracks are featured by way of padding out this three disc release. The main gig here, though, is much later – Loreley Festival, Germany in 1996 – recorded for the Rockpalast TV show. This was an early outing for present guitarist Rickey Medlocke who at the time had not long rejoined the band. Hughie Thomasson (Outlaws) completed the usual three guitarist assault with the other original member Gary Rossington. Other originals were Leon Wilkeson on bass and Billy Powell (keyboards). The set list is also familiar, pretty much a well-trodden greatest hits with heavy dependence on their first two, definitive, albums. Of course, you probably won’t really beat the original live album ‘One More From The Road’ with the classic band at the peak of their powers – but this is a good-sounding recording and a band still on form. The bonus third disc here is a DVD of the original TV concerts, although understandably the 1974 gig is a bit rough visually if not aurally. However it makes a change from the Old Grey Whistle Test footage in 1975 that is invariably rolled out to commemorate ‘Freebird’ or “guitar rock”. This entry was posted in ALBUM REVIEWS, ALBUM REVIEWS (Mobile), All Posts and tagged 1974, 1996, album, DVD, Gary Rossington, Hamburg Musikhalle, Hughie Thomasson, live, Loreley Festival, Lynyrd Skynyrd, review, Rickey Medlocke, southern rock, Sweet Home Alabama. Bookmark the permalink.